I began serious photography in 2005. I always had an interest in photography but had never really “jumped in.” My main focus was on sport photography at first, especially jiu jitsu and mixed martial arts. I occasionally shot landscapes and other assorted shots in my spare time, but never thought about taking photos as a business. But then people started asking me if they could buy my photos, and I set up AliciaPhotos.com. 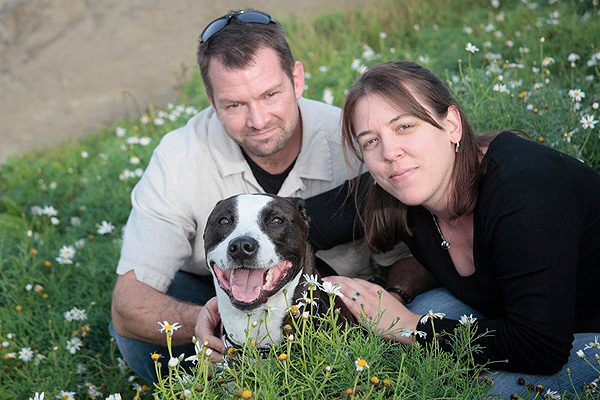 In 2010, my husband and I had some spare time and decided to help dogs. Dogs were not allowed where we lived at the time, so we researched rescue organizations to see how we could help. We both had been raised with dogs, and we missed having them around. 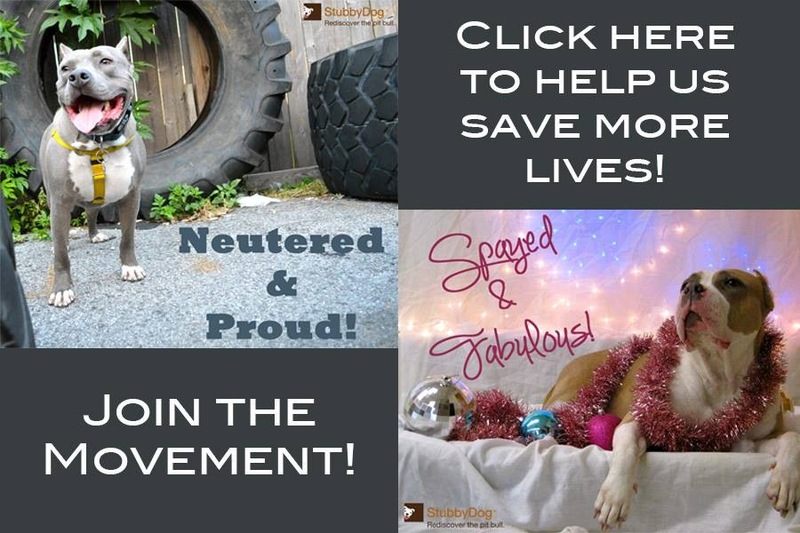 We discovered Pit Bull Rescue San Diego and started helping at adoption events and walking foster dogs. I began snapping pictures of the adoptable dogs, and soon I was being asked to more events as a photographer than as a dog handler! 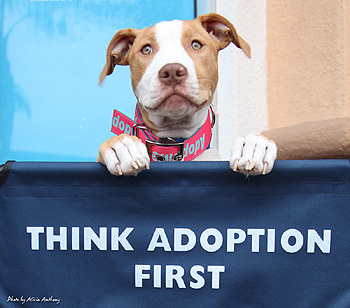 Knowing that my photos might help get a dog adopted was one of the best feelings ever. I’ve had a several people contact me after adopting a dog to tell me that they only went to see the dog because of seeing photos I had taken. In addition to Pit Bull Rescue San Diego, now I also help at Pretties with Pitties, Even Chance and It’s the Pits. 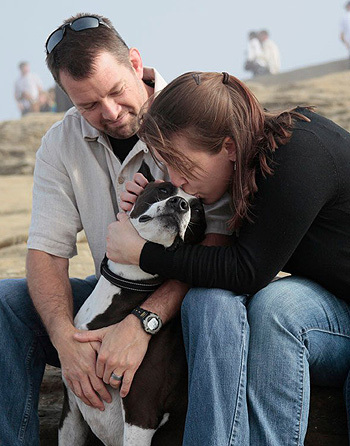 In September of 2010, my husband and I moved so that we could foster a pit bull in need named Ozzie. Ozzie had lost his forever home and had bounced from foster homes to boarding facilities, never quite fitting in anywhere. We met Ozzie at our first adoption event as volunteers in May of 2010. When we heard he was running out of options, we offered to foster him. I’m happy to say that we adopted Ozzie, and we don’t know what we’d do without him in our lives. Every day he makes us laugh, and I love coming home to his huge smile. I watch his whole body wiggle as he waits for me to put my things down and rub his belly! It feels so great to know he’s ours forever! Thanks for all you do Alicia. You are awesome! Alicia, your pictures are amazing. So glad that Ozzie is thriving with you! Love your story, can relate…actually lived in a community that got my 2 Staffordshire Bull Terriers banned, they were deemed Dangerous Dogs (had chip implants), had to put up 6′ Tall Privacy Fence around property, and hang signs…their both rescue dogs, and one is almost 15 yrs old…public awareness is important, related stories like Michael Vick are most of what public hears, not the years of obedience and service of our successful animal friends…”Animals don’t make bad pets, People do!!! Thanks for all you do!